So you're finally tired of the 9 to 5 rat race and you want to get into organized crime, huh? Well, there's a few things you're going to have to consider. Like, for example, how much do you like Italian food? You're gonna want to eat lots and lots of Italian food, and also be prepared to get offended if someone suggests that their momma's food is better than yours. Plan on learning several creative and effective ways to intimidate people, particularly when it comes to them not paying back money. Are you able to get your hands on a horse's head? Or some cement shoes? Any of those things should do the trick. Actually, now that we think of it, organized crime is probably not a great alternative to a boring 9 to 5 job. There's a much better chance of going to jail, you've always got to keep an eye out for violent rivals, and there's really only so much Italian food you can eat before the heartburn sets in. Maybe all you need to change your life is a nice Zoot Suit. Gangsters love dressing nice, especially in those throwback Zoot Suits, and maybe just the change of outfit would make you feel better. And just in case you find that perfect suit, we've got the perfect hat for you. 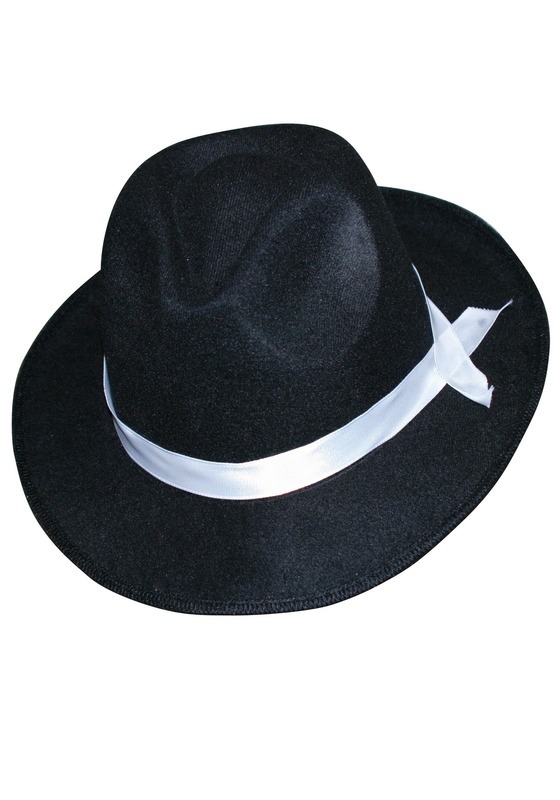 This Zoot Suit Gangster hat is made from quality pro felt (nothing else but the best for our mobsters), and sports a white hat band around the top. Get yourself feeling stylish and sophisticated by adding this hat to your gangster or swing band outfit. Would love to have had it a little more oval shaped, rather than round. And the brim was totally crushed. With a little work, we got most of the waves out, but it wasn't as sharp as the rest of the suit. Not “real” hat material but was perfect for what I needed. Little stiff. Not quite as big as the other hat we ordered, but still serviceable.. It fit my big head.